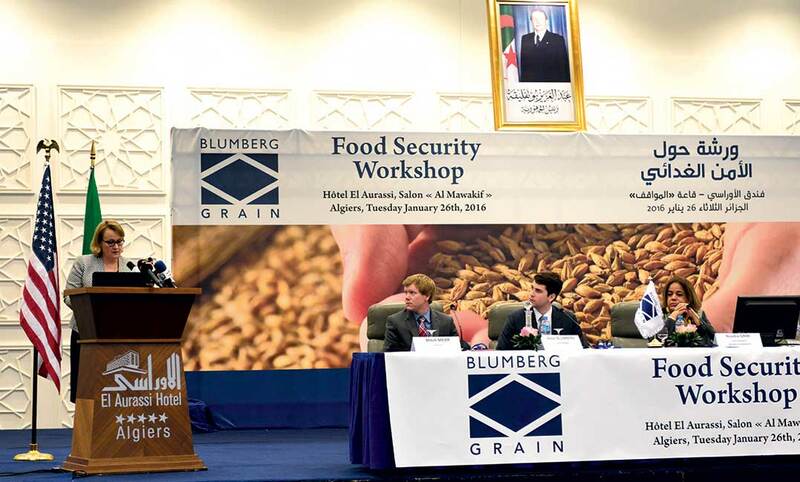 Miami-based Blumberg Grain’s mega-project to build state-of-the-art grain storage facilities across Algeria – estimated by David Blumberg, the company’s CEO for the Middle East & Africa, to save the country some $200 million in post-harvest losses – seems stymied by internal politics. Philip Blumberg, founder & chair of holding company Blumberg Partners, says he is confident growing support in Washington, DC, may provide the motivation to clear the necessary hurdles. In March 2016, he says, he met with Algerian Prime Minister Abdelmalek Sellal, who had heard about Blumberg Grain’s other projects in the region, including a network of 100 storage facilities in Egypt monitored and controlled by a single command control & logistics center in Cairo. Thirteen months later, despite continued assurances from Prime Minister Sellal, the contract remains unsigned. Blumberg Grain works primarily with emerging market governments to develop networks of food storage infrastructure that reduce post-harvest losses from more than 50% to less than 5%, says David Blumberg, often doubling the nationwide output of locally harvested crops. The impasse, says Philip Blumberg, appears to stem from a tendency of bureaucrats in the region to thwart the will of elected officials, perhaps rooted in an anti-American bias dating from Algeria’s alliances with the former USSR. Those resources include support from the highest levels of the US government. Among many who have sent letters to the Algerian ambassador supporting the project are Rep. Debbie Wasserman-Schultz of Florida, immediate past chair of the Democratic National Committee; Rep. Ileana Ross-Lehtinen, a Miami Republican who just announced her upcoming retirement from Congress, and Jeb Hensarling, a Texas Republican who chairs the House Financial Services Committee. Adding their voices to these appeals are several suppliers who work with Blumberg Grain on large international projects, stating that they have already invested significant time and resources on the Algerian project since it was sole-sourced to Blumberg Grain more than a year ago. President Trump is watching the issue with interest, Philip Blumberg says, since it would involve the creation of 2,400 jobs in the heartland – “Trump country, where he has promised more jobs as part of his Hire American Buy American program. If a contact was not signed what is the base for a lawsuit. Maybe they like the plan but can not afford it. It is necessary to be crazy to make affairs with Algeria. This failed country is not reliable. Jen O.: General Electric was and is still doing business with Algeria for more than 40 years and they just landed a multi-billion dollar deal. Not so crazy, isn’t it. So many things Algeria could be blamed for. Unreliability is NOT one of them. The problem with Algeria is the corruption and the shady government. You have to know and share who is behind the curtains in order to get anything done. The Chinese understood that and they are ripping the country of it’s resources. No wonder! you propose a big project like this that costs too much money for a small country like algeria. no contract was signed therefore no obligation. that’s why Trump didn’t intervene. he is a business man and he understands business. Taking it to a Lawsuit is big bullying and not proper business practise. Trying to get in bed with algeria in first place by knowing all emerging countries suffer from burreaucracy and corruption requireds patience. . .
and if the chinese or the russians have a more affordable solution that does the job then it is their full right to consider all offers as buyers who didn’t sign any contract. trying to get the president of the US to pressure a small country like algeria is like holding a gun to someone’s head and forcing them to buy whatever you sell! Agree with B. Rachedi. The paper is about a supply driven offer, like hundreds that may be made everyday to a government. It did not go through, so is the end result of other similar offers. Then, wait for a open, transparent bid to be made and make an offer. The issue would be different if the government was at the source and asked for an offer promising a contract after specifically defining the terms of such offer, he would have created legitimate expectations which he would later frustrate and may be ground for compensation. I understand that’s not the case here. Here are the reason why the contract is pending, according to TSA Algerian newspaper.. The first point of divergence concerns the fact that the OPCW has requested that the integration of the project of the license of the management software and remote control for the 100 warehouses for storage either without financial impact. However, Blumberg Grain proposes to incorporate only with an amount of $40 million. An amount deemed “unjustified and disproportionate by the Algerian party. Another point of disagreement: The OPCW has claimed that the American company transmits to him a complete folder and in conformity with the regulation in force including an administrative folder, an offer detailed technical as well as a financial offer. However, the source close to the OPCW has qualified the content of the documents provided by Blumberg grain as being “summary” and not allowing a “objective assessment” of the American proposal, both on the technical plan that on the financial plan. This company, Blumberg, has absolutely no business being in this business. They have probably wasted millions of dollars trying to persuade these governments to go in and build their little food storage huts at exorbitant prices when the Chinese or even these governments themselves can build them at a fraction of the price.